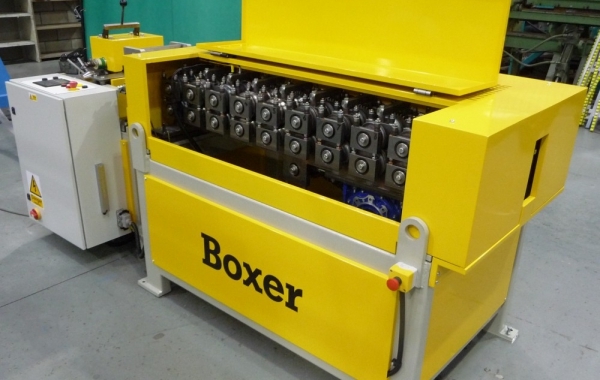 Fixed Sideplate machines provide a durable, cost effective means of rollforming sections up to 60mm high from most metals up to 3mm thick at speeds of up to 35m/min. 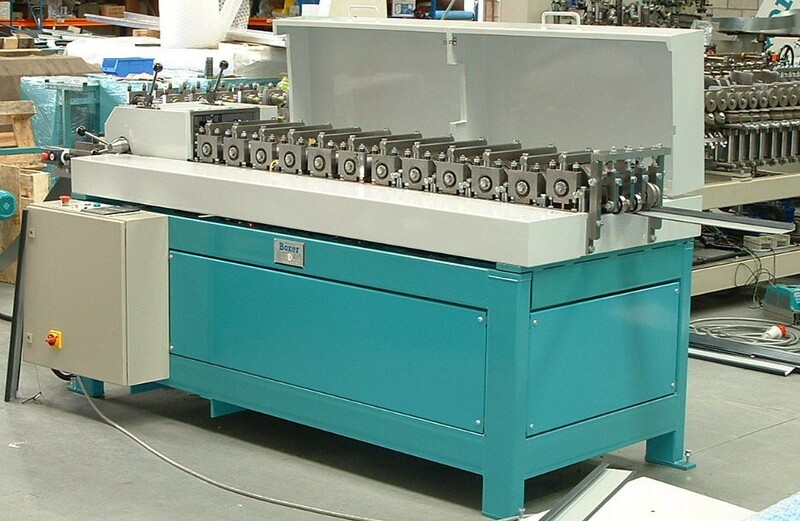 They can also accommodate up to three different sets of tooling at the same time. Product width adjustments can be made without having to change tooling. The number of forming stations vary from six for the simplest profiles through 24 and beyond for complex profiles. 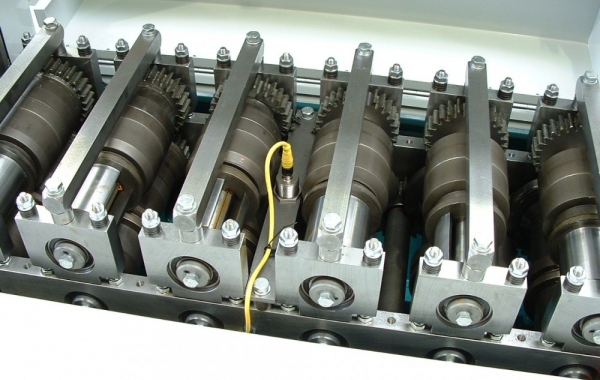 For blank-fed operations the minimum component length is limited to at least twice the horizontal roll centres. It can be reduced by 50% by using inter-station guides. 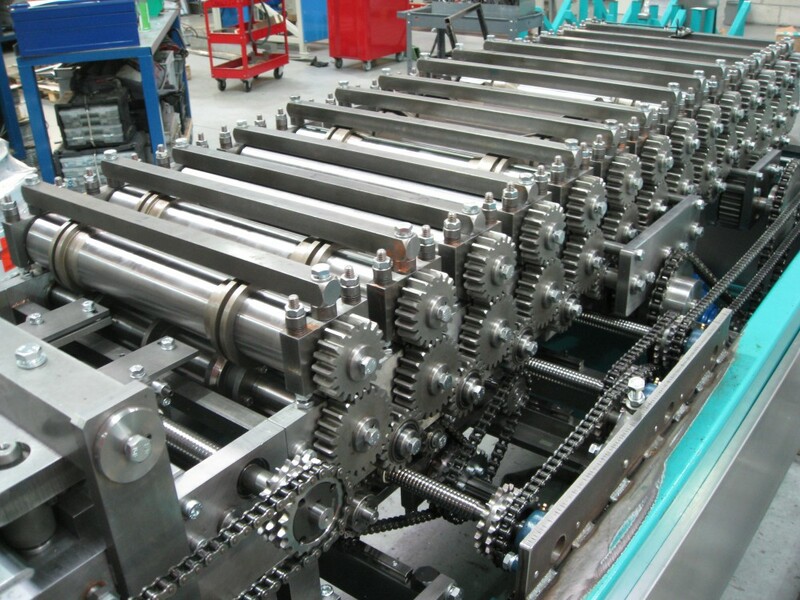 The vertical, and hence horizontal roll shaft centres are dictated by the maximum form height of the profile to be produced, which may or may not be the finished height of the product. 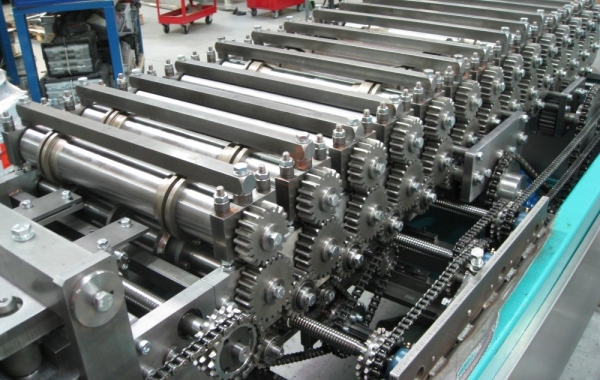 Large products demand large roll shaft centres. The number of forming stations is governed by the complexity of profile shape, the gauge and type of material. 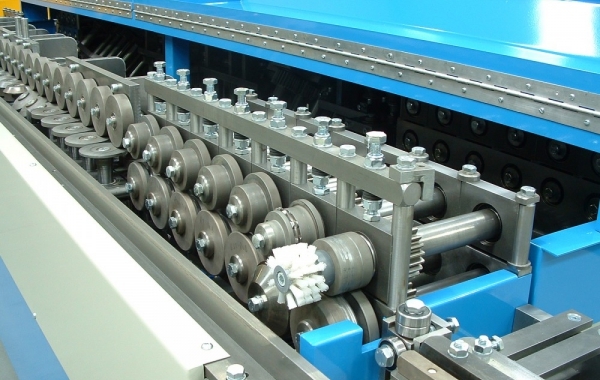 Most rollforming applications utilise one roll set per profile, however, several widths of the same profile can sometimes be produced using split rollers and C spacers. 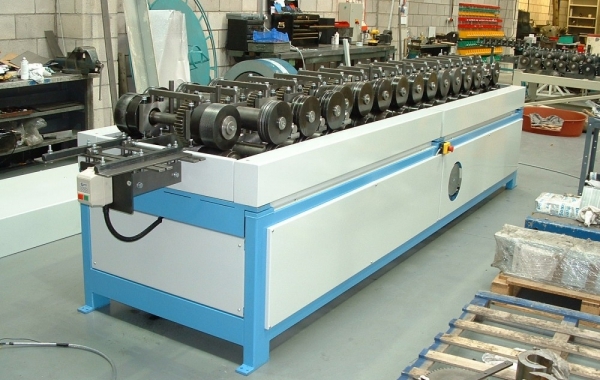 For stepless width change our ‘Roller Beam’ mechanism provides rapid adjustment by hand wheel. 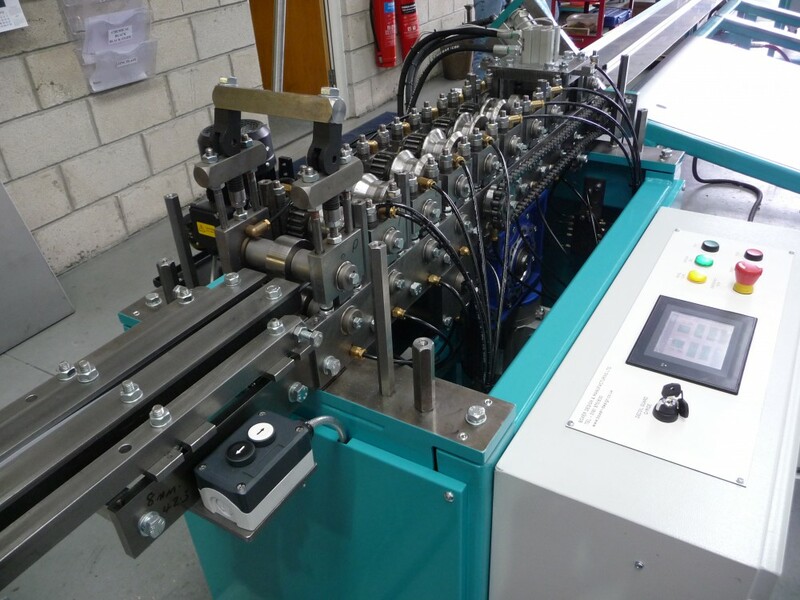 Alternatively, up to three roller tooling sets can be fitted to one machine, allowing the forming of either profile at random with no tool change. 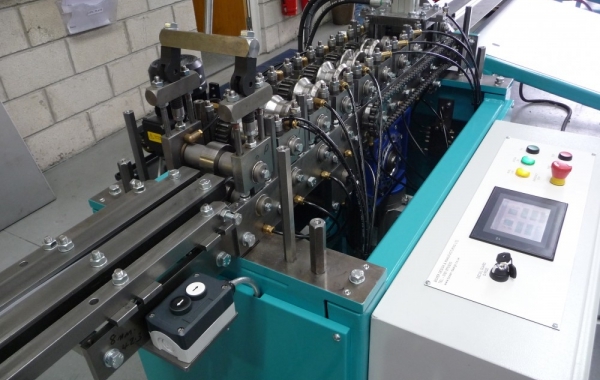 Where production lines demand rapid tooling change, then rollforming machines with interchangeable tooling heads or cartridges provide maximum production flexibility with minimum down time. 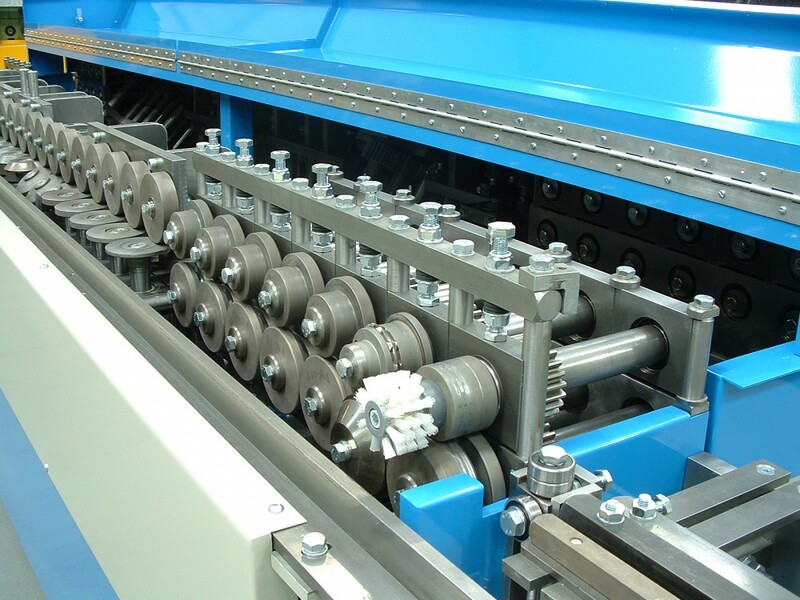 For blank-fed operations the minimum component length is limited to at least twice the horizontal roll centres. 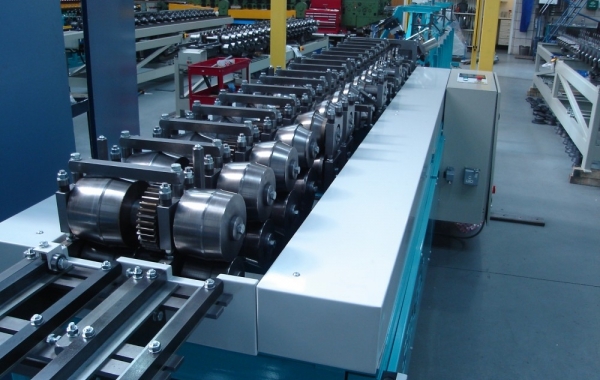 These machines carry the bottom roll shafts in rolling bearings between the pairs of one or two piece rigid sideplates, and the upper roll shafts between individually adjustable upper bearing blocks. These bearing blocks are pressurised by means of stacks of disc springs, allowing roll lift for gauge variation. A quiet, low maintenance drive is ensured by use of the frame mounted helical geared motor unit, driving via low speed, heavy duty chains to the head input drive shaft, where the hardened spur gear train, running on rolling bearings transmits the drive to the roll shafts. All bearings are sealed for life or re-greasable. 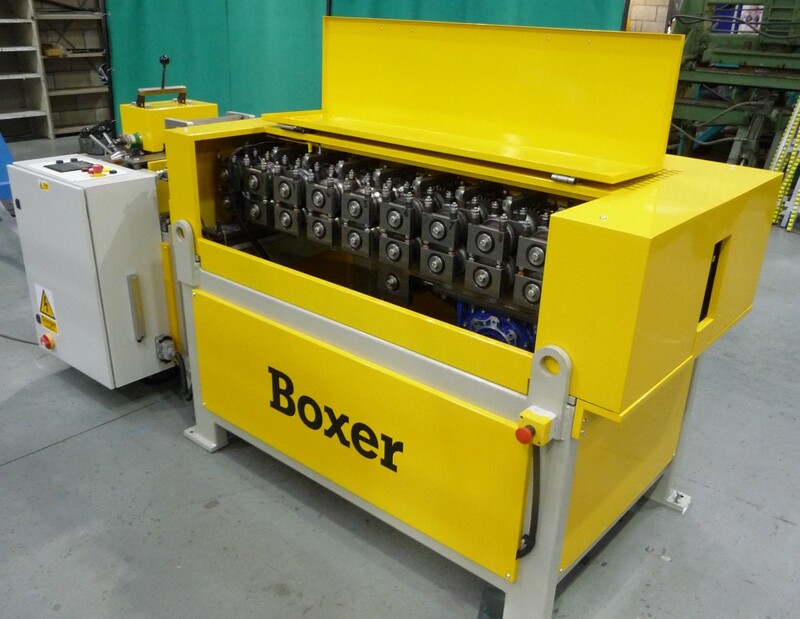 Up to three roller tooling sets can be fitted to one rolling head, dependent upon the product requirements. 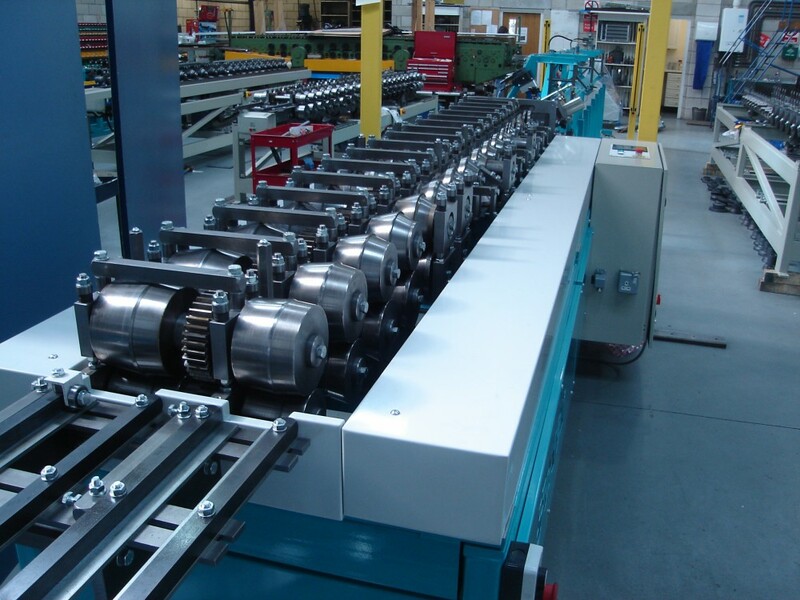 Strip or coil-fed profiles are commonly formed down the centre of the rolling head between the side plates, whilst sheet edge profiles must be formed on outboard roll sets to either side of the forming head side plates. 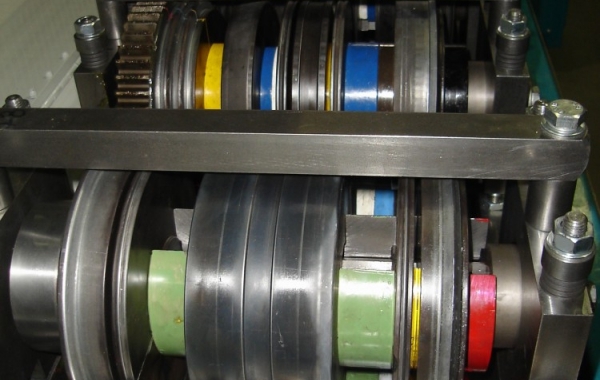 Strip-fed products can also be formed on roll sets on the outboard extension shafts, but this usually necessitates the use of outrigger bearing blocks to prevent undue deflection to the free end of the shaft. 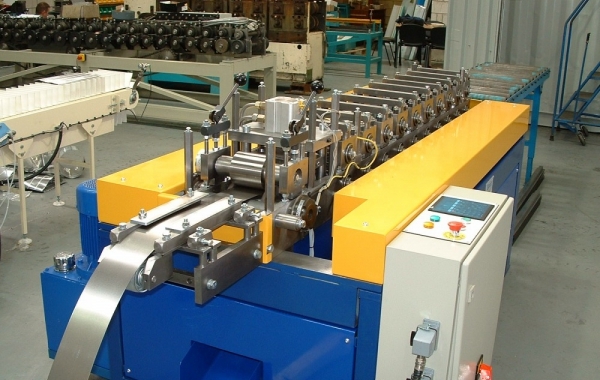 Three strip-fed products can be tooled on one rolling head by using this method. 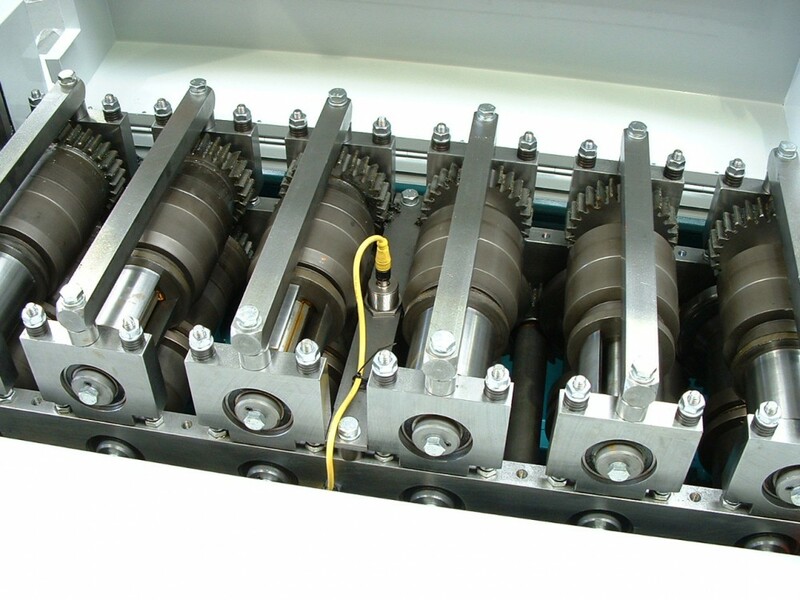 This essential feature allows for any roll shaft to be withdrawn after removal of one roll-fixing screw, allowing greatly simplified maintenance for form roll, gear, shaft or bearing replacements. 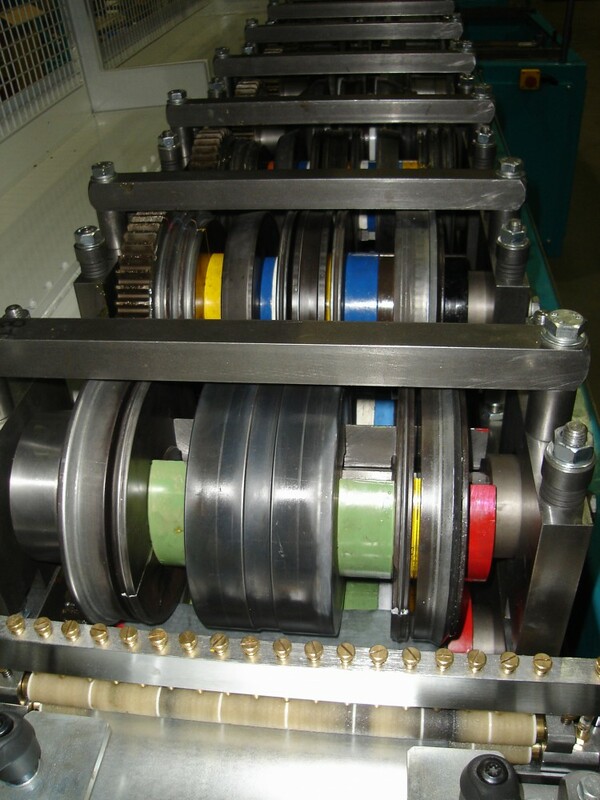 Idler gears or bearings can be replaced without the need for a full head strip down. Simply remove one screw and slide out the shaft. The hardened steel guide bars are of adequate length for optimum component guidance and can be tailored to suit the individual needs for multi-width strip feeding. 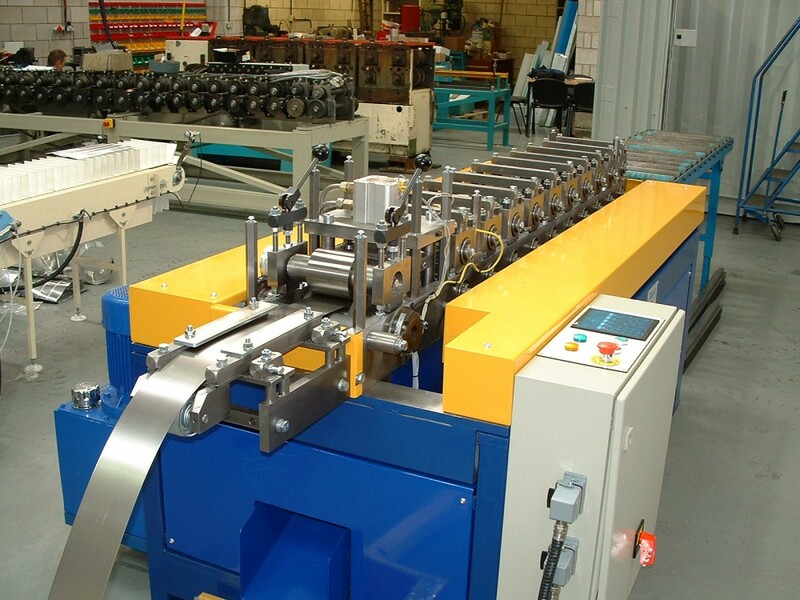 Machines producing symmetrical sections and sheet edge profiles are fitted with jack adjustable exit straightening rollers to allow for correction of any vertical bow encountered through changes of gauge etc. A three-way adjustable Turks Head exit straightener is fitted to machines housing tooling sets for the forming of non-symmetrical and more complex strip-fed profiles, generally utilising bronze die blocks giving the ability to correct vertical, lateral and torsional distortions on exit from the rollers by simple hand knob adjustment. 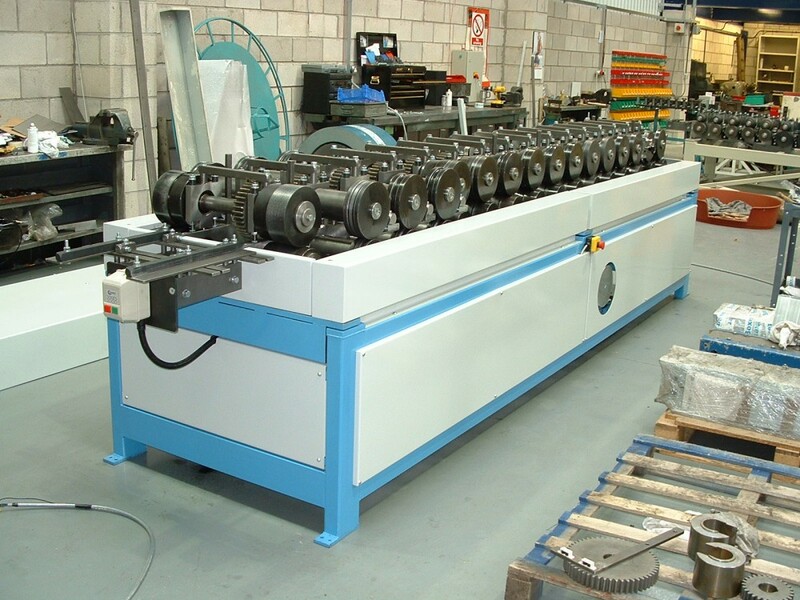 The machine base which carries the rigid rolling head unit and houses the rolling head drive, comprises a robust structural hollow section welded fabrication with removable panels to all sides for maintenance. Heavy gauge sheet metal fabrications extend above the base frame providing multi-piece removable guarding for the rolling heads.